If you have a vehicle needing non-collision repairs like dent removals, car scratches or door ding repairs, then you’ve come to the right place! Paint Shuttle provides a mobile body shop service for minor auto body repairs at your home or office in Miami, Broward and Palm Beach Counties of South Florida. Our technicians are fully-licensed, certified and insured and can return your vehicle to like-new condition. What a better way to have your car or truck back in showroom shape with all the dents and dings repaired! In some cases, we can even provide you with a paintless dent removal, but every repair is different. We come to you, on your terms, and bring our 20 years of knowledge, skill and experience with us. Use our Online Contact Form for one of our agents to call you. 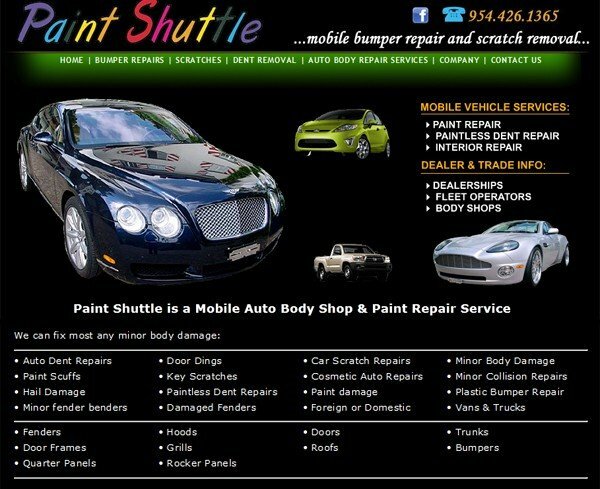 Paint Shuttle provides a mobile body shop service for minor auto body repairs, dent removal, bumper repairs and car scratches at your home or office in Miami, Broward and Palm Beach Counties of South Florida.